A past employer misspelled my name on an award they gave me. They gave me a corrected award about a week later. But this left me wondering what to do with the misspelled award. The award was a plate made of solid bronze that was about 10 inches in diameter. The plate rang like a bell when suspended by a string and hit with a drumstick. It may have been useful as a cymbal, but I had no need for a cymbal (Bruce may, but that is his problem). 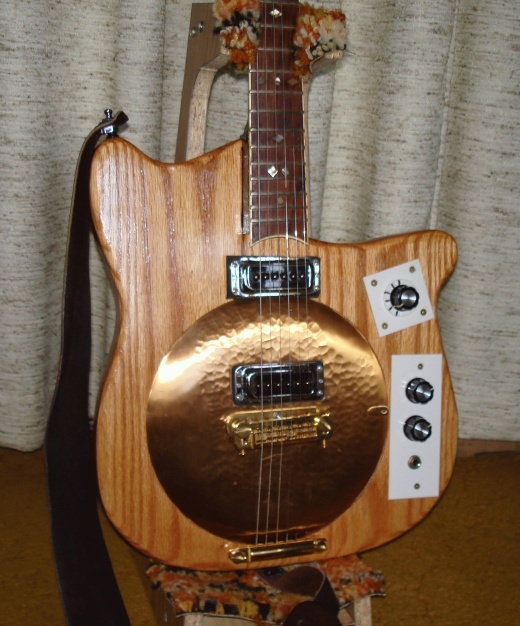 So I decided to make an electric guitar out of it, which I refer to as the Bellplank. The result is shown in Figure 1. 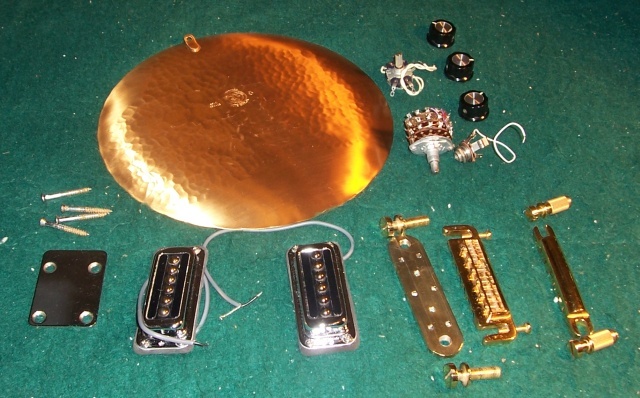 Figure 2 shows the back of the award plate (the writing is on the other side) and many of the other parts I used to build the guitar. I really didn't want to spend any money on it, so I built it almost entirely out of stuff I had lying around the house. The only thing I had to buy for it was the tailpiece for terminating the strings. The only hardwood I could find around the house that was suitable for the body were two pieces of the same type of wood. I don't know what kind of wood this is, though a couple of people have told me it looks like oak. One piece was about 34 x 9.25 x 0.75 inches, the other was about 28 x 9.25 x 0.75 inches. I wanted the body to be at least 1.5 inches thick. It also had to be wide enough for the 10 inch diameter plate, some space for the controls, and some clearance around the plate and the controls. This meant that I had to cut both these boards in half and glue the resulting pieces together to get the desired thickness and width. 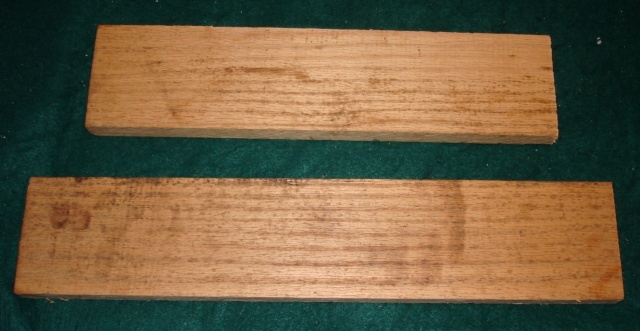 After providing lots of overlap when the boards are glued together, the resulting body was 1.5 inches thick, 15 inches wide, and 17 inches maximum long above the neck and 14 inches long max below the neck. 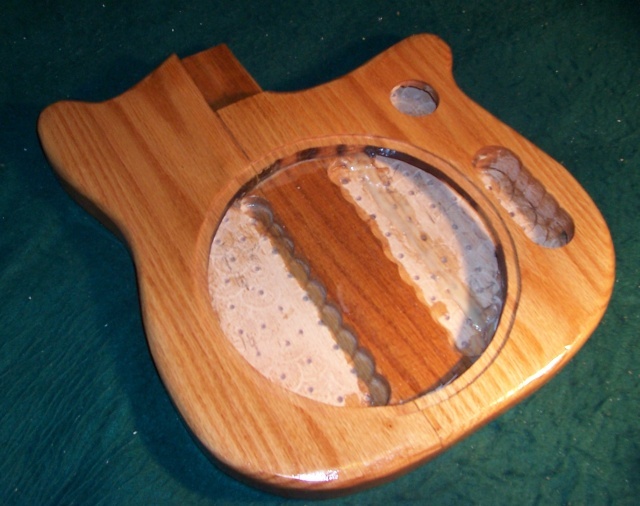 Figure 3 shows the completed body prior to adding the hardware. I wanted the body to be hollow as much as possible, particularly below the plate. So I hollowed out the boards with Forstner bits prior to gluing them together with West Systems marine wood epoxy (the same stuff I used to make the hovercraft). Figure 4 shows a little better how the body is hollow. It also shows the glue joins between the boards with the overlaps. Note that the bottom board was not hollowed out in the area that would be under the strings. This was to try to keep the body from bending due to the string tension. The bottom is 0.75 inches thick under the strings and about 0.3 inches thick most everywhere else. The top is about 0.3 inches thick everywhere except in the ring area where the plate will mount, where the top is about 0.6 inches thick. I would have preferred to make the 0.3 dimensions thinner, but I had to keep it thick enough so that the point of the Forstner bits wouldn't punch through the body. Notice the routed out recess around the rim of the hole. The plate will fit in this recess. String tension will hold the plate in place. I don't want any glue or other fastening technique to damped out the plate vibrations or decouple the plate vibrations from the body. Figure 5 shows the back of the body. You can see the glue joint between the two pieces that make up the back. Figure 6 shows the scrap leftover after cutting some of the pieces. This gives a good comparison for what the wood looked like before it was sanded and received two coats of urethane varnish. The neck and tuners were from an old Ovation acoustic guitar a friend gave me. The body and bridge on this guitar were in bad shape and it would have cost more to fix the guitar than what it was worth. 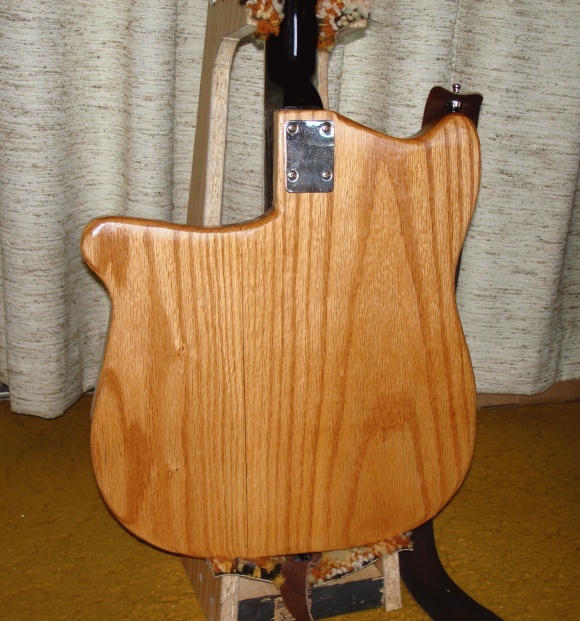 But, since this neck was from an acoustic guitar, the foot of the neck where it joins the body was not well suited for attaching to an electric guitar body. I also wanted the neck to be bolted on in case I had to shim it to get correct string action and also to make it easier to possibly replace the neck with a better neck in the future. So I epoxied three pieces of wood to the foot of the neck to make the desired attachment for the neck. Figures 7 and 8 show the foot of the neck with the three pieces of wood added. The wood used were scraps from the same hardwood that was used to make the body. Note the adjustment end of the metal truss rod, which runs the length of the neck. 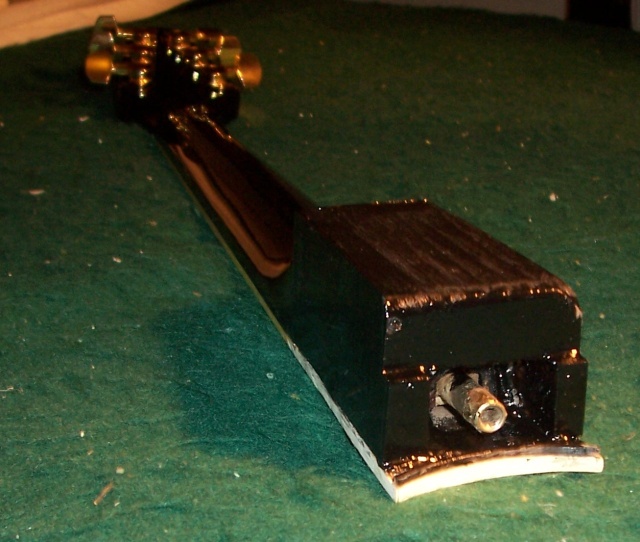 Figure 9 shows the front of the body of the assembled guitar. String tension keeps the plate in the recess in the body. Only the bridge and one of the pickups are mounted on the plate. The bridge is a Leo Quan Badass bridge I got about 20 years ago from who knows where. The pickups are high gain pickups from my 1997 Rickenbacker 330/12 twelve string guitar. I replaced the original high gain pickups on this 330/12 last year with reissues of the toaster pickups used on Rickenbackers back in the early 1960's. The tailpiece is a Guild. This gives quite a variety of sounds with just one switch adjustment. 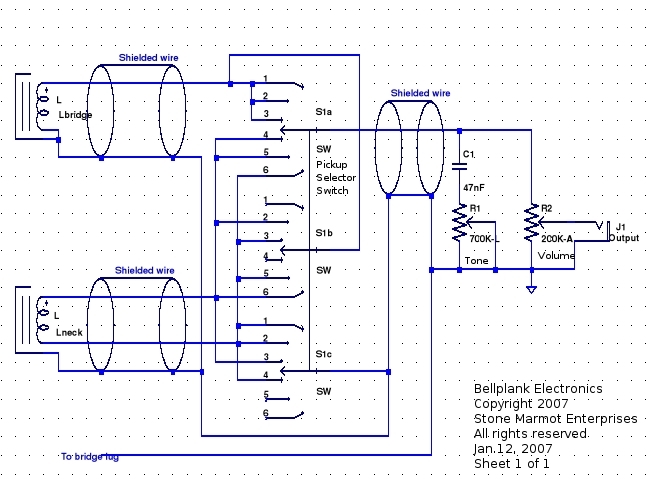 Figure 10 shows the schematic for the guitar electronics. 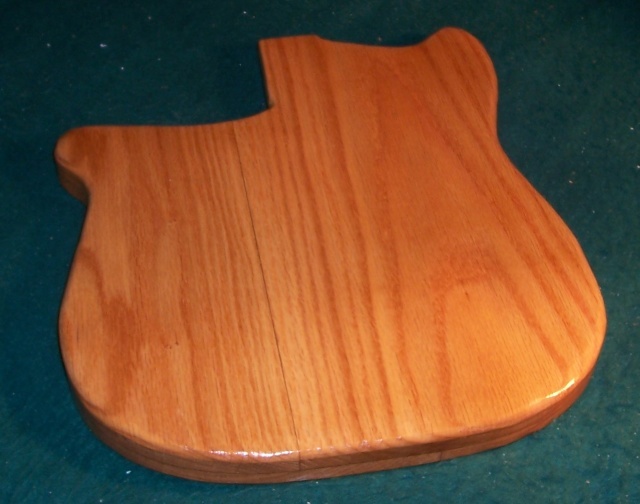 Figure 11 shows the back of the completed guitar. So, how does it sound? Like an electric guitar. I was thinking it may have a very distinctive sound, like a dobro. But, though it does kind of have its own sound, it is more like the difference between a Fender Telecaster and a six string Rickenbacker than a Telecaster and a dobro. 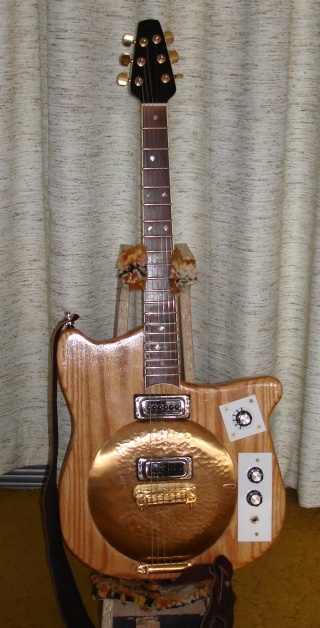 Most of the difference in sound seems to be due to the use of Rickenbacker pickups, a hollow body, and a long distance between the bridge and tailpiece (which causes more sympathetic vibrations between the strings, like a lot of other hollow body electric guitars), and not much from the metal plate. In retrospect, I probably would have to mike the plate (which I may do if I get some time) to pickup the plate vibrations, since the magnetic pickups aren't going to pickup any bronze plate vibrations. Another alternative is to put a piezo pickup (which I have and may try) on the metal plate. The pickup selector switch actually gives a lot more variation and uniqueness in sound than anything else. I'll post some sound clips in the future when I get some time. It does play well. The action is pretty decent. It is heavier than many guitars, weighing about 9.5 pounds. My other three guitars all weigh between 8 and 8.5 pounds. I suspect most of the difference is due to the bronze plate, which alone weighs 1.5 pounds.